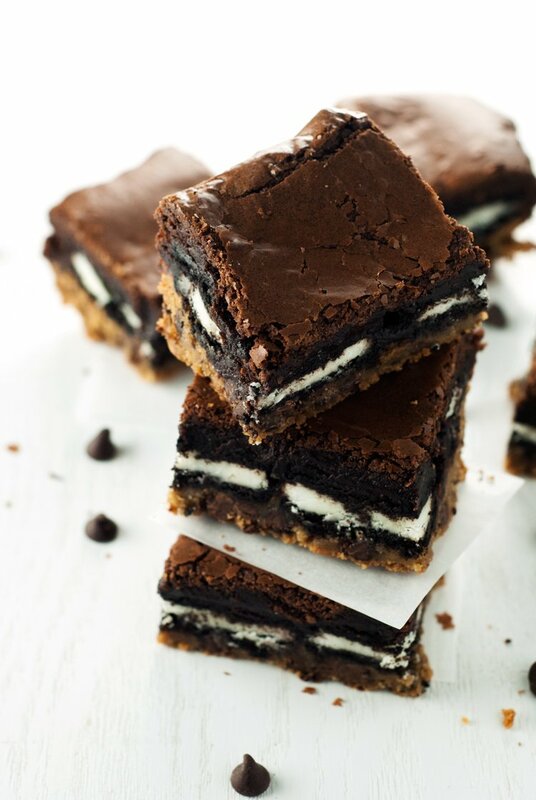 In terms of name, these Slutty Brownies are certainly a little bit risque, but their taste makes up for it, I promise you that! You know, I’m not even sure where the name comes from, or who first made this genius dessert, but if you’ve never tried one, you need to get on that. Right meow. 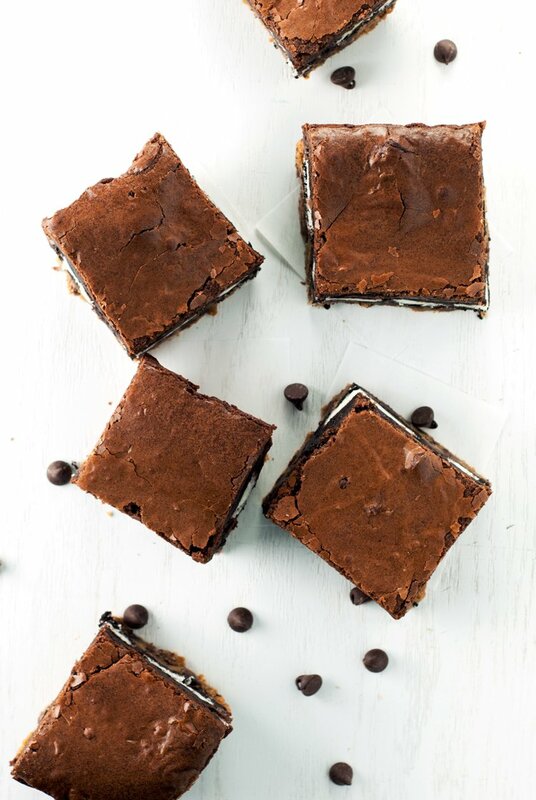 We are talking about layers of chocolate chip cookie dough, creme sandwich cookies, and brownies, all baked together into the most wonderfully decadent, chewy (yet crunchy!) treat in existence. Preheat oven to 350 degrees. Line a 9x13 inch pan with aluminum foil and spray with non-stick cooking spray. 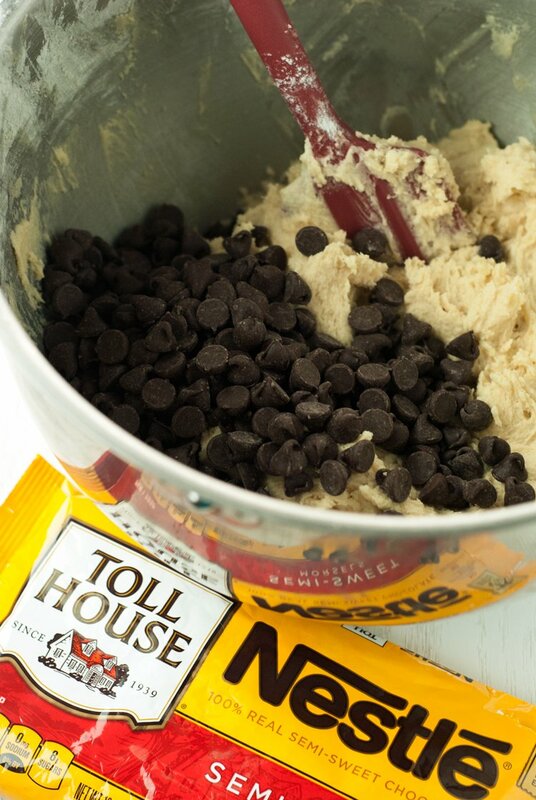 Prepare the cookie dough as instructed HERE, then press it into the bottom of the pan until flat and even. Place the creme sandwich cookies on top of the cookie dough until it's completely covered. Melt the chocolate chips and butter in a large stainless steel bowl placed over a saucepan of simmering water. Remove from heat and gently stir in the cocoa powder and sugar. Gently whisk in the eggs, one at a time until fully incorporated. Stir in the vanilla. Add the flour and salt and stir until combined. Pour the batter over the cookies and dough, smooth out with a spatula, then place in the oven and bake for 30-35 minutes, or until a toothpick inserted into the center of the dish comes out clean. 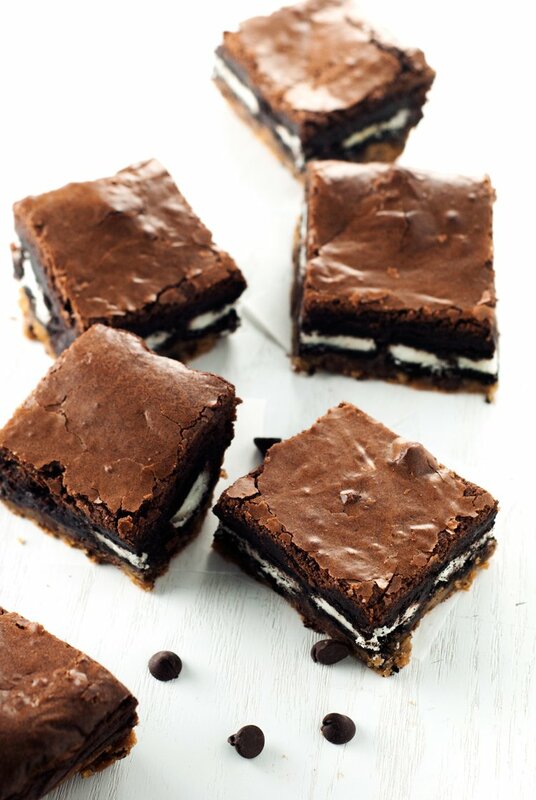 As I’m sure you all know, my secret to these amazing Slutty Brownies is NESTLE® TOLL HOUSE Semi-Sweet Morsels. They make the cookies tastier and they melt like a dream! Perfect for this dessert. Is it just me, or do you enjoy popping some chocolate chips straight from the bag? I’ve always had a sweet tooth, but growing up, my dad was always stealing the chocolate chips twice as often as I. Mom would get so mad at us, because we’d never tell her when the bag was empty, and when she would decide to make something, oops! no more chocolate chips. Ha ha ha. Nowadays, I am constantly combating Charli, who is constantly getting into everything! This morning I caught her with chocolate chips twice! Granted, I should have put them away sooner, but I was running around like crazy and forgot. It happens. Ah well. Her chocolate face was adorable regardless. 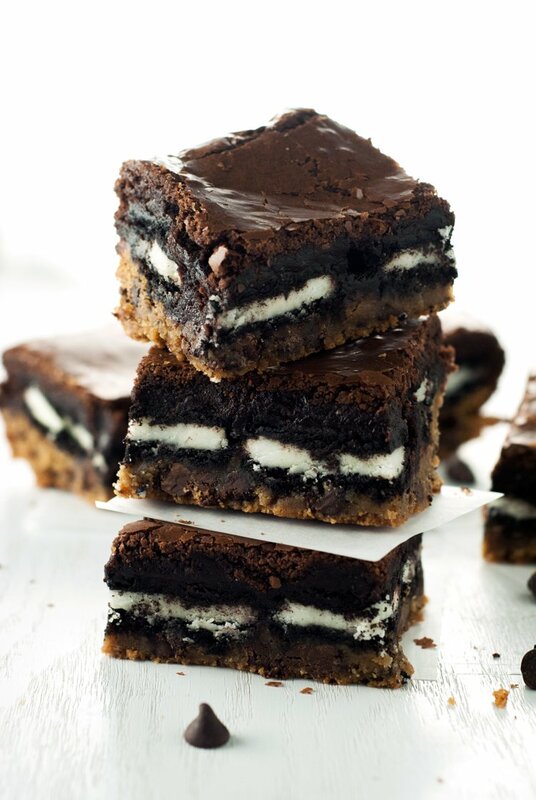 These Slutty Brownies, though, zomg, everyone is going to be begging for more after you make these. I promise. They are like dessert crack, if there were such a thing. So yummy. It will kill any and all sweets cravings for like…a month. They are that decadent. Wonderful. Now, if you don’t mind me, I am going to go eat that one piece I hid in a closet to keep it away from the kids, ha!